Communications interoperability was a major focus of this year’s IACP conference, and I spent some time with Firetide discussing how their wireless infrastructure was being used by public safety departments across the country to help officers, firefighters and EMTs work together during critical incidents. I spoke with Marketing Communications Manager Ksenia Coffman about the advantage of mesh networks, and how police officers can utilize broadband wireless to their advantage. For example, the Denver, Colorado Police Department used Firetide technology during the 2008 Democratic National Convention. They set up 75 cameras on Firetide’s wireless infrastructure and used video surveillance to monitor crowds around the city. Firetide is also being used by law enforcement officers to identify perpetrators, lock down secure convictions with video evidence, keep surveillance in parks and recreation, and can work in conjunction with the traffic department on roads and highways. For example, the police department of Sandy, Utah is using this device to keep officers safer in harsh weather conditions as well. Before using Firetide, the department had to send out police cruisers to check snow conditions on highways in the winter, but now they have the technology to use video surveillance so officers don't need to be deployed in unsafe conditions. 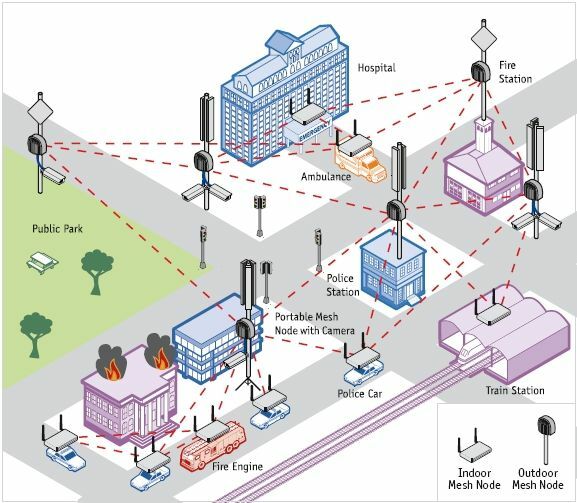 Broadband wireless mesh networks are changing the shape of public safety communications interoperability. The sophisticated technology can be used for every day operations as well as critical incident response, and provides an affordable solution for communication across jurisdictions. Read about how other departments are using Firetide.